Today’s assignment from Greg Balanko-Dickson is overdue. It is to post about “the face behind the blog”… to give you some insight to get to know more about me. I can’t really tell you lots about me without first introducing you to my family. I am the oldest of four girls. It’s great having sisters!!! I grew up in a small town in Ohio, went to Kent State and majored in public relations. After I graduated, lived in Atanta for a year and then moved to Rhode Island for 11 years. I took most of the classes for an MBA in marketing before moving back to Ohio in 1991. Now I live in another small town in Ohio called Hudson, about 20 minutes north of Akron, 40 minutes south of Cleveland. I can see this gazebo from my office window. Back in the mid-eighties, I was a brand manager at Hasbro, working on Boys Toys. Fun stuff. GIJoe. Transformers. Here I am with Sgt. Slaughter and two top marketing minds: Neil Friedman — a top exec at Mattel and Alison Shinners — a Chicago marketing guru with experience at Tiger Electronics, Playskool, Mattel Games and other household consumer products. In October it will 28 years since Keith and I got married. True love! 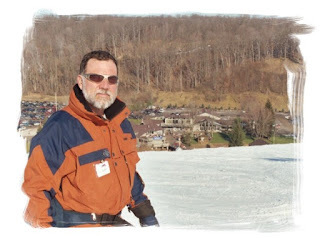 Keith is a member of the National Ski Patrol, most often working at Boston Mills/Brandywine. He’s an active EMT basic volunteer with Hudson EMS and is about to complete his paramedic training next week. He’s also a master rappeller and an avid beekeeper. Keith and I met at Girl Scout camp when he was 16 and lifeguarding at the camp. I was 15 working as a camp counselor. Now we have a daughter who is almost 16, Rebecca. Although she still likes to hang out with me sometimes, she has really grown into her own person. This is a photo from last summer when she and I drove to Maryland to visit my sister and help her move into her new home near Annapolis. 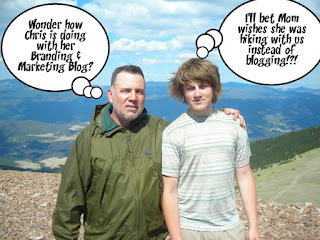 Last summer Keith and our son Ben hiked many miles on Philmont’s Mount Baldy with Ben’s Boy Scout troop. Philmont is a giant Boy Scout ranch in New Mexico and a hiker’s paradise. They were gone for two weeks. Ben… also known as Neb, just graduated from his senior year at Hudson High School and plans to attend Kent State University to major in Visual Communications Design in the fall. I like to travel, but don’t get much as time to do it as I would like while running my marketing business. 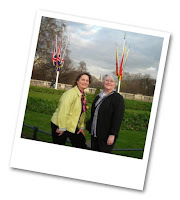 In March I traveled to London and Rotherham to attend the Athena Leadership awards banquet and participate in the Athena Cafe with my friend and mentor Norma Rist. If you look very carefully at the photo at the right, you’ll see Big Ben in the distance betwen my face & Norma’s. We were standing across the street from Buckingham Palace. In 1998 I founded a marketing firm, Marketing Resources & Results. We work with clients to create their branding and strategic marketing programs. We also help companies create sales tools and implement marketing tactics by providing graphic design, press releases, direct mail, sales materials and websites. Basically it’s an outsourced marketing department for companies who want to grow, but don’t have the time, talent or resources to get to the next level. Our goal is to provide clients with the marketing resources they need, to get the results they want. As of Monday, when our intern from Ohio State University starts, there will be a total of 7 employees. We recently received the WBE certification which means we can help our clients achieve their supplier diversity goals. It’s terrific to see these glimpses into your life! I enjoyed learning more about how you came to what you’re doing now and I’m impressed by how much you’ve done with your business. You go, girl! Hey, Chris! It was great to read more about you and see the photographs of your family. I haven’t gotten around to doing a similar post yet. It was especially interesting to read about how you started your business. Congrats on getting your WBE certification. Hi Chris, it was nice to get to know you better through this meme! I met both of you in Chicago and Tammy, I really enjoyed your version of the face behind the blog. So Connie, I tagged you to do one! Thanks for posting your “face behind the blog” and good luck with your soon-to-be new member of the family. Thanks a lot for joining in the Face Behind The Blog! I’ll head back to mine and add you to the original list of participants. Thanks for the link! IÂ´m the oldest of four girls, too. It really is great having sisters, even though IÂ´m pretty far away from them now, I still stay in touch with the next one down and she visits my family every Christmas. Great to meet your family. Thank you so much for sharing them with us. I really loved this meme. And I’m so happy David started it. It’s added a whole new dimension to my blogging. Chris, what a great life you have! And a very physical family. I love this meme!